As we near the end of the first quarter of 2011, the potential for a widening of the uprisings in North Africa and the Middle East has pushed oil prices past the $100 mark. Long before the riots began, commodity prices had risen to uncomfortable levels, having soared over 30 percent in a matter of months. Currency creation by emerging market central banks was, and is, a major factor behind the rise in oil prices. Egypt’s M2 money supply, for example, rose 13.3 percent during 2010, while China’s M2 money supply increased by 17 percent and India’s M3 money supply increased by 15 percent. When currency creation outpaces GDP growth, too many artificially created rupees and yuan and pounds and euros chase too few goods, and price inflation results (Figure 1). Major currencies, including the US dollar, have been declining in purchasing power for years, but now the rate of depreciation is accelerating. Investors are losing confidence in the ability of the world’s largest economy to lift itself out of its $14 trillion debt. When (not if) interest rates rise from their artificially low levels, interest paid on the debt will soar. The Washington Post estimates it will quadruple by 2014. “When governments reach the point where they are borrowing to pay the interest on their borrowing they are coming dangerously close to running a sovereign Ponzi scheme,” says economist Nouriel Roubini. The US is rapidly approaching that point, and investor anxiety is increasing in concert with the realization that currency creation for bailout purposes – the knee-jerk monetary response to the financial crisis – is no longer a temporary matter. As quantitative easing becomes institutionalized, the “safe haven” US dollar continues its decline, sending precious metals prices higher. The US Federal Reserve is quietly trying to ward off economic disaster by purchasing hundreds of billions of dollars of US Treasury bonds via the second stage of its quantitative easing program, QE2. Few investors seem to care that the Fed is in effect funding the US government; that QE has created $2 trillion new US dollars out of thin air that debase the value of existing US dollars; or that QE1 and QE2 have been pumping liquidity into the equity markets, and thus pushing stock prices to unrealistic levels. Monetary inflation leads to price inflation, and today’s rising energy and food costs reflect that fact. Food prices have political consequences in emerging markets because the cost of food consumes such a large percentage of income. The 9.0 earthquake and tsunami that rocked Japan in March have dealt the country’s already struggling economy a potential knockout blow. At the time of writing, Japan’s central bank had already poured nearly 60 trillion yen ($688 billion) into the economy, but that is just the beginning of the money creation. Hundreds of trillions more new yen are expected to be pumped into the economy over the next few months in an effort to keep it afloat. Japan’s devastation and its efforts to recover are going to add fuel to the currency fire, sending precious metals prices higher. QE supporters say that QE currency creation is used to stimulate the economy, and not used to finance government spending. This is a very fine line indeed. Richard Fisher, president of the Federal Reserve Bank of Dallas, doesn’t even bother to draw the line. He puts the blame on Congress: “The Fed could not monetize the debt if the debt were not being created by Congress in the first place,” Fisher said recently. “The Fed does not create government debt; Congress does.” Fisher is technically correct, but the Fed is and always has been Congress’s enabler. Without acquiescence from the Fed, America wouldn’t have been able to sink into its current debt quagmire. The consequence of this movement away from currencies will be a decline in real purchasing power. 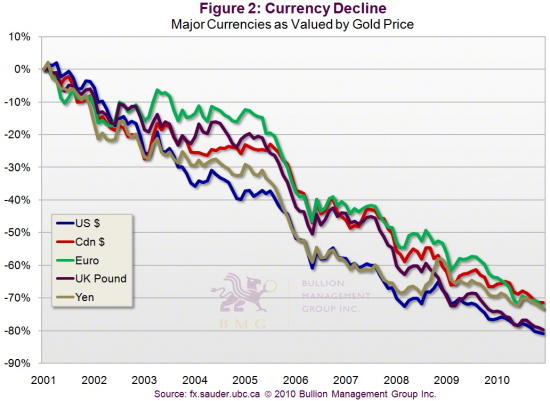 If we examine a 10-year chart of the US and Canadian dollars, the British pound, the euro and the yen (Figure 2), we can see that these currencies have lost between 70 to 80 percent of their purchasing power in terms of gold. In truth, however, gold is not rising. Currencies are falling in value, or purchasing power. In 2009, for the first time in 20 years, monetary gold, or central bank and investment buying, outpaced gold buying for industrial or jewellery purposes. 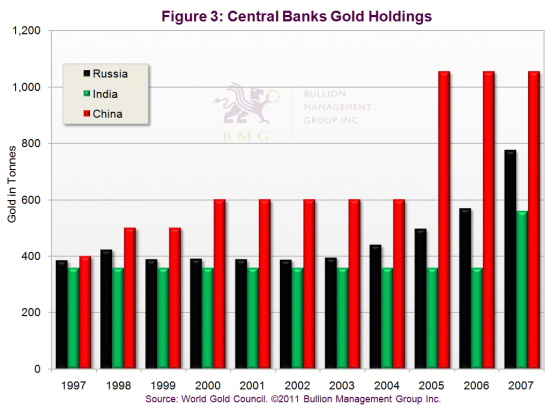 In 2010 China, Iran, Russia and India’s central banks were all significant buyers as they moved cash reserves to gold. As the flood of cheapening US dollars continues to flow into developing world economies, emerging market central banks are converting substantial amounts of their dollars and other paper currency reserves into gold, partly due to currency-related fears. In the third quarter of 2010, Russian central bank gold holdings rose 7 percent to 756 tonnes. In 2010, the Russian Central Bank bought two-thirds of its own gold production. In December we learned that China had imported 209.7 metric tonnes of gold in the first 10 months of the year, a 500 percent increase over the same period in 2009. This was in addition to the purchase of its own world-leading gold production (Figure 3). By the third quarter of 2010, India’s gold imports for the year, both commercial and private, were 624 tonnes, putting them well over the previous year’s total of 595 tonnes. Fourth quarter purchases could put India’s annual total over 750 tonnes. 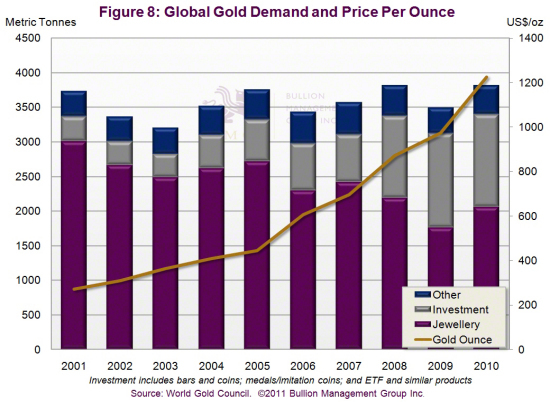 Investment demand for gold and silver is soaring, due in part to inflation fears in many of the emerging economies. A key demand driver is China, whose massive population and surging economic growth has led to rising prosperity and a burgeoning middle class with a keen desire to protect their new-found wealth. Although the West shares many common economic principles with the East, because the banking systems are similar, in one area there is a clear distinction: how Easterners view the role of gold as money. 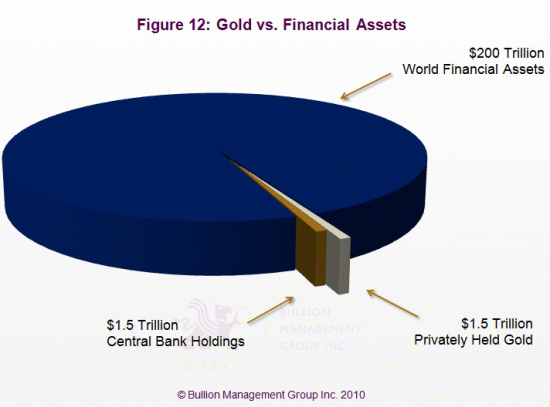 Western governments fear the rising gold price because it restricts their ability to create currency. They fear rising silver and platinum prices because these are harbingers of economic uncertainty and instability. In the West, governments borrow and encourage their constituents to follow their example. Banks encourage us to borrow for everything from vacations to widescreen televisions made in China. They tell us we are “stimulating” the economy through consumption. 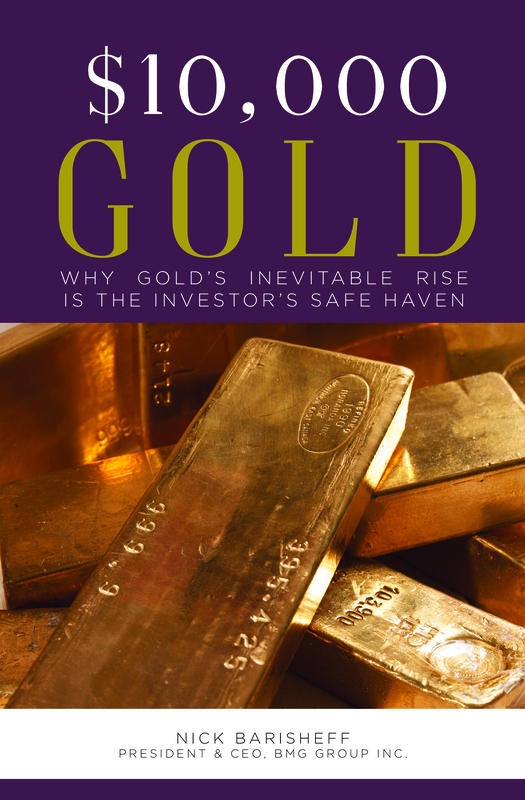 Generally speaking, the investing public in the West sees gold as a wealth-gaining asset to be traded like stocks and bonds. This is why Westerners are constantly fretting about the price of gold in currency terms. The Chinese government, on the other hand, respects gold. This is evident by the laws they have passed to facilitate mining and private gold ownership. China currently leads the world in gold production. The government encourages the public to put 5 percent of their savings — yes, they encourage saving — into gold. This is significant because the Chinese can save up to 40 percent of their annual salary. The campaign appears to be working: In the first two months of 2011, domestic gold purchases in China jumped to 200 metric tonnes, far outpacing the previous year. The Chinese see gold as a wealth-preserving asset that will weather all seasons. Pierre Lassonde, former CEO of Newmont Mining, thinks that buying by the Chinese public will eventually propel gold prices into the stratosphere. Federal Reserve Chairman Ben Bernanke’s $600 billion QE2 program infuriated the Chinese. It not only debases the value of the $840 billion in US Treasuries that the Chinese hold, but it also requires them to debase the yuan, which is pegged to the dollar. 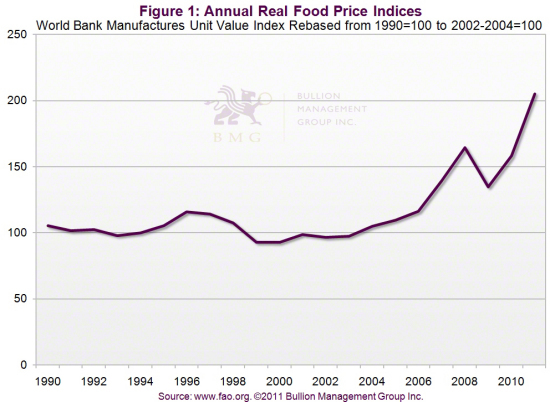 This causes inflation, which is showing up in rising food prices. The ensuing rift between the US and China may develop into the major gold-related news story of 2011. Currency wars lead to price wars. We saw the beginning of this in November 2010, when China began putting price controls on Wal-Mart. Although all major countries are participants in this “race to debase”, the battle between the US and China is the most significant. China has been financing the US for years through the purchase of US government securities. In 2010 we saw an alarming decrease in Chinese US Treasury purchases. This has led to a vicious cycle in which the Fed has to buy US debt with more currency creation, which leads to more debt and interest payments for the US taxpayer. Morgan Stanley Asia Chairman Stephen Roach says the US should expect “a natural, organic reduction of China’s buying of dollar-denominated assets.” This is troubling news for an already beleaguered US dollar, as America’s escalating debt will likely encourage more policy measures that devalue the dollar, further depreciating China’s US bond portfolios in the coming years. The aging population is a result of two things: a populace that is living longer, and the “pig in a python” effect of a tidal wave of baby boomers, born between 1946 and 1963, who are beginning to retire (Figure 4). As people age, they spend less and downsize. GDP and tax revenues are reduced and a much smaller workforce follows the baby boomers, creating a triple whammy. This problem is universal. In China, it is further exacerbated by the one-child-per-couple policy. Governments will have no choice but to create more currency and further debase it. The baby boomer generation has been the world’s prime socio-economic driver for the past 50 years. As they were getting married, buying houses, having children and starting to invest, the boomers drove a growth economy. Now, as they approach retirement, the economy will slow as boomers’ spending habits decline, because they already own everything they need. So consumer spending, which has driven the economy for the last number of years, will begin to drop. Moreover, as they start withdrawing money from the system in terms of pensions, social security and Medicare, boomer retirees will become a cost to society. In the US, social security is a giant black hole with obligations in the order of over $100 trillion. The government is already spending money that is not in the program. 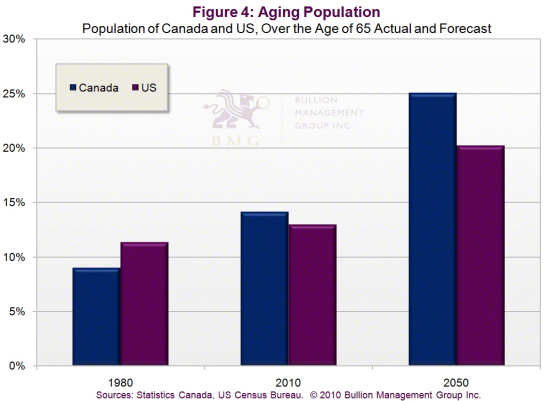 As the baby boomers age, Medicare obligations are going to be massive. This will result in a reduction in GDP, a reduction in government revenues and an increase in government outlays, which will force the government to borrow more money. At some point, monetization by the Fed will go into overdrive because the US will no longer be able to sell its debt to foreigners. This is not just an American problem, however. Japan, Russia and many European countries are in the same boat. As governments race to debase their currency by creating more and more, the price of precious metals will continue to rise. Outsourcing has almost entirely destroyed the manufacturing sectors of many first-world countries like the US and Canada, and much of Europe. The Chinese worker who built your iPhone made $287 a month; this was after a well-publicized raise. The West simply cannot compete with these labour costs. The US was the world’s largest manufacturer after WWII, and has driven the world’s economy ever since. 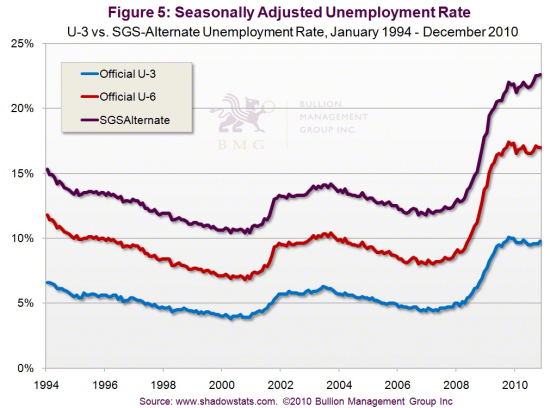 However, the dismal US unemployment rate (Figure 5) means Americans are no long able to buy things with their former gusto. As factories move offshore, the high unemployment becomes systemic. Without jobs, the GDP and the tax revenues of the US fall. As the mountain of federal, state and municipal debt becomes harder to service, the government will be forced to go even deeper in debt and to further debase its currency. Peak oil is the point at which the maximum rate of global petroleum extraction is reached, after which the rate of production enters terminal decline. 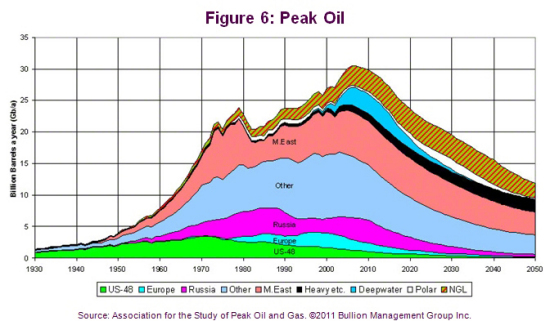 Peak oil has already been reached in the US, Alaska and the North Sea (Figure 6). In other words, the era of cheap oil is rapidly coming to a close. In the next few years, Mexico will become an importer of oil and the US will lose its third-largest supplier. America’s fragile, highly indebted economy relies on this land-based cheap oil to grow, and it will not easily withstand the shock of transitioning to more expensive alternatives. September 2010, a German military think-tank reported that the German government was taking the threat of peak oil seriously and was preparing accordingly. Numerous studies from around the world have concluded that we are very close to peak oil production, which will be accelerated due to Gulf drilling bans and unrest in the Middle East. Even the National Petroleum Council recognizes the end of cheap oil. In its July 2007 report, “Hard Truths: Facing the Hard Truths about Energy,” the Council concluded that “hydrocarbon resources are becoming more difficult to access and challenging to produce [and the] costs of developing and delivering energy are escalating.” (www.npchardtruthsreport.org). Peak oil will inevitably lead to uncontrolled inflation on a global scale, because oil is a vital component in the discovery, delivery, manufacture, refinement, processing, packaging, distribution, sale and consumption of virtually every product on Earth. According to the International Energy Agency, over the past year the oil import costs for the 34 countries that make up the Organisation for Economic Co-operation and Development soared by $200 billion to $790 billion. “Oil prices are entering a dangerous zone for the global economy,” reports Fatih Birol, the IEA’s chief economist. Interestingly, he made these remarks before the uprisings in North Africa sent oil prices skyward (Figure 7). Oil prices are surging, but they could skyrocket over the coming weeks and months if the uprisings in North Africa spread to Algeria and Saudi Arabia. Some analysts are predicting $220 per barrel should Libya and Algeria halt oil production. The US is the world’s largest consumer of oil, importing almost 10 million barrels per day. China is now the second-largest consumer. Among the top 15 consumers are Japan, Germany, France, Canada, Italy and the UK. Yet outside of Canada and China (which, like the US, produces roughly half of its daily consumption and is also the world’s third-largest producer), none of the others are in the top 15 for production. Rising prices as a result of peak oil will hurt the fragile US economy most, because America currently pays less for oil and gas than any of the first-world countries. 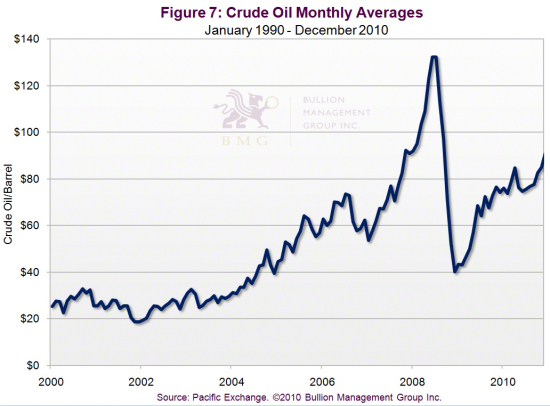 When added to the effects of the waning strength of the petrodollar, the results will be devastating. Gold, silver and platinum prices will continue to rise, driven by a shift away from depreciating paper currencies and massive economic growth in China, the world’s second-largest economy. Despite rising prices, overall demand for gold is expected to remain strong in 2011, building on 9 percent growth in 2010, its highest rate in a decade (Figure 8). Investment demand for gold is soaring, and investment in physical bars surged 56 percent over the past year to reach 713 tonnes. In recent years the Chinese government has actively encouraged its 1.3 billion citizens to put a portion of their savings into silver and gold. China and India are major demand drivers, accounting for over half of world demand for jewellery, bars and coins. China is poised to overtake India as the world’s largest consumer of gold, thanks in part to strong economic growth, but also due to the government’s gold-centric policies. Since 2003, China has more than doubled its official gold reserves, yet even today, gold accounts for only 1.6 percent of the total reserves held by the People’s Bank of China, China’s equivalent of the US Federal Reserve. Chinese officials are on record as saying that the country needs to raise its gold reserves, which are considered “inadequate” compared with the 8,133 tonnes held by the US and 3,408 tons by Germany. Given the size and scope of China’s central bank, this bodes well for future gold demand. India continues to be the largest market for gold, accounting for approximately 20 percent of world demand. India’s gold imports surged to 800 metric tonnes in 2010 (compared with 557 tons in 2009) driven mainly by investment demand. Indian consumers see gold as a store of value and protection against inflation, which has been surging over the past several years. Indian investment is traditionally in the form of jewellery as opposed to gold bars. Jewellery demand rose 67 percent year in 2010, despite rising prices. Gold demand in India has increased 13 percent per year, on average, during the past decade, outpacing the country’s real GDP, inflation and population growth by 6 percent, 8 percent and 12 percent respectively. Currently, Indians own roughly 18,000 tonnes of aboveground gold, or approximately half an ounce of gold per person. This is significantly below consumption in Western markets. Since incomes and wealth continue to rise in India, there is plenty of scope for additional future growth. Gold has already surged to new highs in 2011. Like gold, silver has been money for thousands of years, and was used as ordinary coinage in both Canada and the US until 1965. Recognized for its unique attributes as both a monetary and industrial asset, silver is both a safe haven in the event the economy regresses and a scarce commodity that will soar if the economy enters an inflationary boom. Despite its recent price rise, silver remains undervalued compared to gold, and the recent “backwardation” in the price of silver reinforces this view. Backwardation occurs when the current or spot price is higher than the price for future delivery, clearly indicating that there is a silver shortage, since demand is greatly outpacing the ability of dealers to deliver. Many factors are pushing silver prices higher today (Figure 9): falling currencies are raising the likelihood of spiralling inflation; new hightech applications are increasing industrial demand; rising energy costs are pushing production costs higher; and China, India and other developing economies are ramping up their silver purchases for industrial and investment purposes. 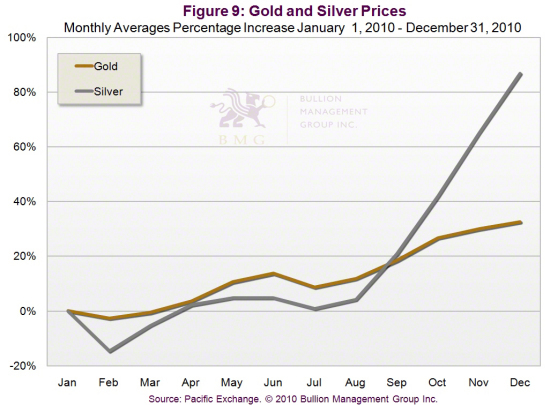 The supply/demand characteristics for silver are even more attractive than for gold. For many years, the governments of India, China and Russia have been selling off their stockpiles of silver, but now these countries have curtailed sales. Silver shortages are the most likely reason. Globally, demand from the developed world combined with accelerating demand from the emerging world should continue to stretch the limits of supply. While it is true that silver is ten times more abundant than gold, silver has been in supply deficit for many years because much of it is consumed. Although silver is a critical component in a vast number of industrial and high-tech applications, the amount of silver consumed in each application is generally so small as to make recovery economically unviable. In addition, investment demand is likely understated. China, the world’s third-largest producer of silver, imported four times as much silver in 2010 than the previous year, and demand shows no signs of abating in 2011. Meanwhile, escalating drug wars in Mexico are threatening to choke off silver production from the world’s second-largest producer. Silver may finally be ready to jettison its title as the “poor man’s gold”. Regardless of how well or how poorly fundamentals are clearly in silver’s favour. If the economy shows signs of recovery, industrial and monetary demand will push prices higher, and if the economy continues to stagnate or decline, silver will remain firmly in demand as a store of value. The price of silver, like gold, is simply mirroring the disarray in the global monetary system. How long can silver prices keep going up? As long can monetary authorities keep printing currencies at breakneck speed. 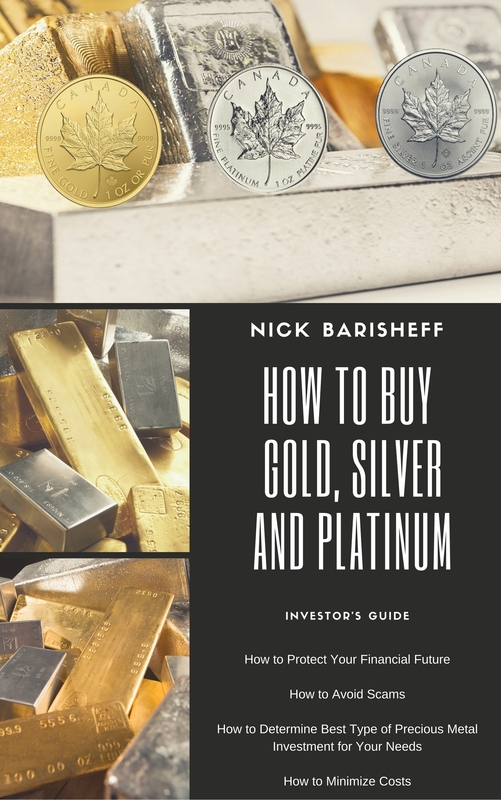 While gold and silver are often in the news as they jump to new highs, there is little or no mention of platinum, even though it has been in an uptrend for ten years. 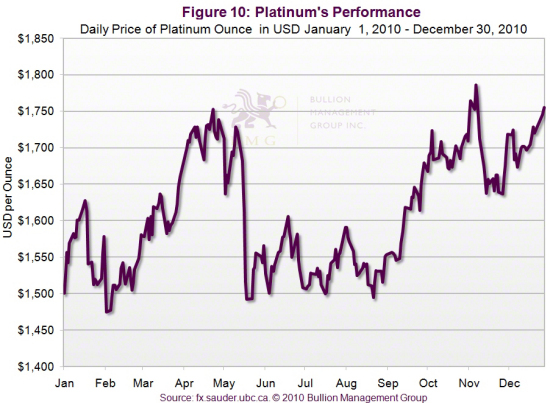 By year-end 2010, platinum had reached $1,755 per ounce (Figure 10), well beyond the $1,070 level reached in 1980, and not far from its pre-crisis 2008 high. By any metric, but especially compared to its precious metals cousins, platinum is considerably undervalued. Beyond its jewellery and industrial demand, there is increasing investment demand for platinum because platinum, like gold and silver, is a store of value. 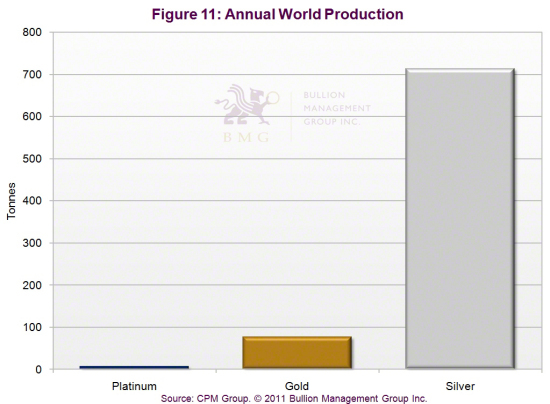 But platinum’s supply story is even more dramatic than that of gold and silver. Total annual world production of platinum is about 7 million ounces − a mere 10 percent of the world’s annual gold production of 76 million ounces, and less than 1 percent of the world’s annual silver production of 416 million ounces (Figure 11). South Africa supplies about 75 percent of the world’s platinum. Platinum is both a monetary and an industrial metal, so platinum prices are influenced by the price of gold and silver, as well as by key applications such as catalytic converters for automobiles. Auto-catalyst and industrial demand rebounded by 18 percent in 2010. Demand for industrial uses other than autos rose 30 percent in 2010. Current platinum prices are limiting production as the industry’s margin is “barely positive” at these prices, according to BNP Paribas. In addition, a stronger South African rand and rising energy and wage costs are pressuring margins and constricting supply. For these reasons, platinum should be considered a key portfolio holding, a store of value and an exceptional wealth preservation vehicle. Supply constraints combined with increasing demand as a result of rising global inflation should help propel platinum prices higher in 2011 and beyond, while investors seeking a safe haven will discover that platinum, along with gold and silver, preserves purchasing power over the long term, more so now than ever as paper currencies decline. The three long-term trends we noted above will have consequences for years to come, especially in the developed world. The cost of supporting aging populations whose income is destined to flatten or decrease can only create a drag on economic growth. Meanwhile, the ongoing outsourcing of jobs, including skilled labour, will further hollow out already fragile Western economies. Finally, the end of cheap oil will create tremendous unpredictability and price uncertainty, creating exogenous price shocks that will drive food prices to unprecedented levels. As we enter 2011, there is little indication that global governments are any closer to getting their fiscal and monetary houses in order. The US in particular remains on a spending path of a size and intensity never before witnessed in human history. As investors lose confidence in currencies, the world’s appetite for the relatively small amount of available gold will increase. 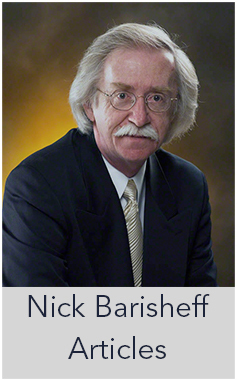 As a direct result of worldwide debt and currency debasement, more people will be competing for the world’s available gold, yet fewer and fewer new deposits are being found. Smaller, lower grade deposits with none of the “economy of scale” benefits of larger deposits are being put into production out of desperation. Mine supply has been in a deficit since 2005. The privately held bullion is largely owned by the world’s richest families and is not for sale at any price. If the world’s pension funds and hedge funds decided to move only 5 percent of their assets into gold and precious metals, which these days seems quite conservative, gold would trade above $5,000. The multiple powerful trends identified in this review confirm that we are in a long-term precious metals bull market with strong fundamentals and many positive indicators. In addition, attitudes about owning bullion have irreversibly changed. Investors are beginning to understand that precious metals are money. They do not lose value like currencies, their past is far longer and their future is far brighter than any currency on Earth.